They were out early in front of the Parliament on Friday, and some had camped overnight. 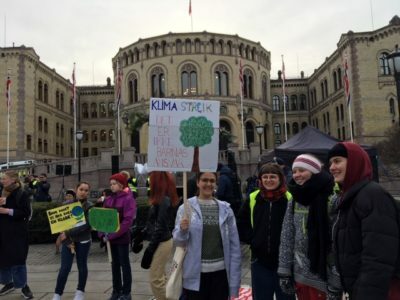 As thousands also gathered all over the country for Norway’s biggest school strikes for the climate so far, they faced both ridicule and scoldings from an elder generation of politicians and other adults who still support the country’s oil industry. Solberg did concede on Friday, however, that “engaged youth who stand up for the climate and environment should gladden us all,” adding in a statement that her government’s “offensive climate policy” is aimed at coming generations. Her ministers in charge of education and climate and the environment will arrange meetings to listen to ideas from young climate activists. Solberg’s government, which includes the pro-oil Progress Party, has no intention, however, of meeting the school strikers’ demands to stop issuing licenses for more oil exploration on the Norwegian Continental Shelf or begin phasing out oil production. The young people clamouring for that and other climate initiatives have also been teased and even accused of being naive victims of propaganda. Much of the ridicule has come from Progress Party politicians like Ole Jacob Johansen from Asker, who even compared the school strikers’ engagement in environmental and climate issues to how children were used in Nazi German propaganda in the 1930s and ’40s. He later deleted his post on social media after criticism that erupted when local newspaper Budstikka reported on it. One of the initiators of the school strikes in Bergen, Vilja Helle Bøyum, told Norwegian Broadcasting (NRK) how many of her classmates have been subjected to hatred and harassment on social media. They’ve been encouraged to “go on hunger strikes instead, or simply commit suicide,” on the grounds that would be good for the climate. “One person suggested they should import hundreds of cars, turn on their engines and let them idle, to ruin things for us,” Bøyum said on NRK’s radio program Politisk Kvarter. She called the harassment “disgusting,” and can’t understand how adults could send such messages “to concerned youth trying to save our future” after the elder generation carried out policies that created the climate crisis. 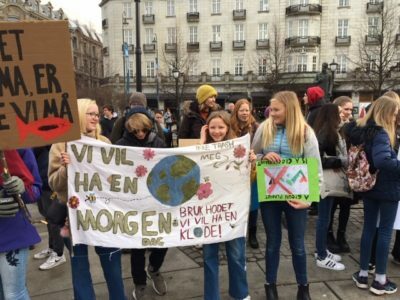 There were many adults, though, including parents like the author of the Norwegian best-seller The History of Bees Maja Lunde, who were indeed talking with their children and even joining them in the strike. “I support peaceful climate strikes because I fear for the future, for my children and for all others on the planet whether they’re people, animals or insects,” Lunde wrote in a commentary in newspaper Aftenposten on Wednesday. Her book depicts how bees can become extinct by the end of this century, thereby also threatening the entire food supply. Lunde was also among cultural and academic celebrities in Norway who signed a declaration of support for the recent school strikes nationwide and especially the major ones on Friday. They all claim the Solberg Government and other top national politicians have failed to pay attention to rising objections to the oil industry, and let down the country during what they consider a national emergency. Another appeal came this week, from more concerned celebrities. “We need civil disobedience to stop the petroleum race,” they wrote in a commentary also published in Aftenposten. They claim oil production and not least oil exploration won’t ensure a secure future for today’s school children, and that Norway needs a “democratic corrective,” on the Conservatives’ and Labour Party-led sides. 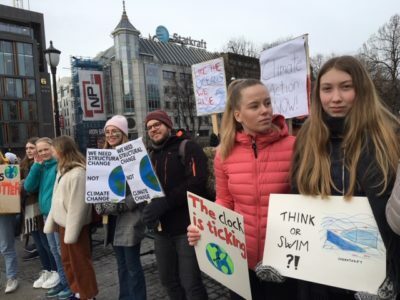 “We see (climate strikes) as a means of defending democracy, to challenge the authorities that they’re on the wrong course,” wrote, among others, author Jostein Gaarder, musician Lars Lillo-Stenberg and professor Thomas Hylland-Eriksen. 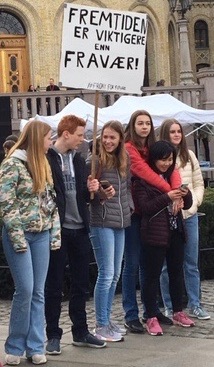 On Friday she and her classmates received support from a much higher place, when UN Secretary General Antonio Guterres praised the school strikes that began in Sweden and Belgium and have spread worldwide. The strikes, he wrote, “should inspire us all” to act at the next UN climate summit.